"Close your eyes, little tiger," said his mother, "and go to sleep." Alternating between real-life scenes with the baby tiger and his mother and enchanted dream scenes of sleep's possibilities, Kate Banks's simple, comforting text and Georg Hallensleben's bright, colorful illustrations make this a charming bedtime story for small children. 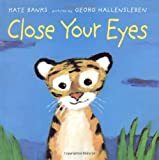 Close Your Eyes is a 2002 New York Times Book Review Best Illustrated Book of the Year and a 2003 Bank Street - Best Children's Book of the Year.